Planet Aid's Winter Clothing Giveaway - Planet Aid, Inc. Planet Aid is donating winter coats and other cold-weather gear to the less fortunate as the temperatures continue to drop throughout the country. 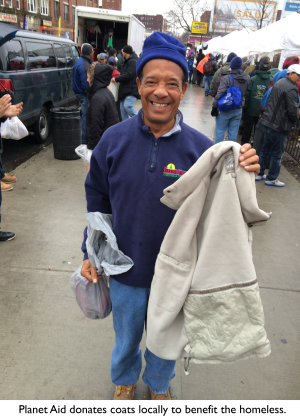 In New England, the Massachusetts office has already donated 650 men’s, women’s, and children’s coats this winter. The cold-weather gear goes to numerous charitable organizations in the area, including the Lazarus House, the Lowell Transitional Living Center, Shadows House, Friendly House, Rosie’s Place, Crittenton Hastings House, Community Actions Program Inter-City, the Worcester County Church of Christ, and the St. Vincent De Paul Mission of Bristol. “We make a point to take the donations weekly as much as possible, especially at this time of the year,” Fernandez added. In upstate New York, Planet Aid donated coats to more than 240 men, women, and children in need during an event on January 10 in partnership with the IBERO Bry Mentoring Program and the United Way Latino Leadership Development class of 2014. The Planet Aid team in Northern Ohio, which donated cold-weather items to The City Mission homeless shelter during last year’s polar vortex, will once again be dropping off items to benefit the organization. The Planet Aid office in Philadelphia has also supported the homeless at the local CYWA Gateway Shelter and will continue to do so this winter. Planet Aid offices in Maryland, North Carolina, Missouri, Michigan, and Western Pennsylvania are planning to donate coats and jackets in their communities this year, as well. To see what else Planet Aid is doing in your area, check out our Local Pages.